A feature of life soon! Cr. Serge Thomann (Port Phillip Council). The increasing incidence of ‘rat runs’ in quiet residential streets? The lack of on street parking in residential streets? The lack of pedestrian and cyclist safety? Council’s lack of response to these issues? If so, then come along to our community forum and hear about the latest research, what can be done, and how other councils approach these problems. Does not practice community responsive strategic traffic management. When was the last time you were consulted about traffic and parking in your Local Area Traffic Management (LATM) scheme? What are other Councils doing, what can be done? When addressing traffic issues the focus is shifting away from vehicular movement to focussing on the safety of the most vulnerable road users (pedestrians/cyclists) The Road User Hierarchy ranks various road users. Goal is zero casualty crashes – if road users persist in unsafe habits (eg speeding), then the road design needs to include traffic calming treatments. The following is a summary of the Amendments ex the relevant Council Meeting Minutes. Details of the Planning Scheme Amendment Process+ are included in the footnotes. Recommendation – That Council seeks authorisation from the Minister for Planning to prepare and exhibit the combined Planning Scheme Amendment (C80) and Planning Permit Application (GE/PP-24474/2012).  Apply an Environmental Audit Overlay (EAO)* over all of the land. Note: A Business 2 Zone (B2Z) promotes a range of office, commercial and residential uses. Rezoning applies to the site bordered in red in the above picture.  Reduce the standard car parking requirements for dwellings and office. The subject land is located within Council’s Housing Diversity Area, known as Glen Huntly Neighbourhood Centre. not less than six (6) residential visitor car spaces. As the land is subject to flooding a Special Building Overlay (SBO), the proposed development will also require the approval of Melbourne Water. Recommendation – Rezone the subject land from Residential 1 Zone to a Business 1 Zone (B1Z). The B1Z aims to “encourage the intensive development of business centres for retailing and other complimentary commercial, entertainment and community uses”. Proposal – That Council seeks authorisation from the Minister for Planning to prepare and exhibit Amendment C78. This rezoning will extend the existing local activity centre at the intersection of North and Warrigal Roads. This site forms part of the larger activity centre that is located in Glen Eira and Monash municipalities. The proximity of this site to such a wide and busy road intersection is not conducive to development normally allowed in a Residential 1 Zone (ie. of a single dwelling or dual occupancy), as this type of development would be severely affected by noise, vibration and fumes. Whilst there is no specific proposal at this stage, rezoning of this land could potentially allow for a mixed use development including shop or office at ground level with residential apartments above (subject to approval from Council). Any such proposal would need to go through the normal process to gain a permit. This rezoning involves only one property. The proposed small increase in potential retail/commercial floor area will have negligible effect on the adjacent local centre and any surrounding centres. No mention is made of impact on adjacent residential areas.  seeks a pre-set hearing date for the consideration of submissions at a Panel hearing. Note: The proponent/applicant has requested the pre-set panel hearing date as they are entitled to do. Generally speaking this is a time saving mechanism when a development is likely to be contentious – the hearing date is set prior to the close of the objection period rather than waiting until all objections have been received and reviewed.  Rezoning the land from Industrial 3 to Residential 1 Zone.  Applying a Design and Development Overlay*** on the land, and inserting a new Schedule to the Overlay (DDO2).  Apply an Environmental Audit Overlay (EAO)* to the land. Currently the 5438 square metre site is used for industrial purposes, as a plumbing supplies outlet. The rezoning will enable the land to be developed for a multi-residential development which is prohibited under the current Industrial 3 Zone. With a higher development yield than would normally apply in minimal change areas. Incorporating a range of multi unit developments. The precise details of the development are not known at this stage. However, broad controls are being put in place which will need to be met. Interestingly, as with the Clover Development in Bentleigh East, the broad controls which are being put in place have yet to be discussed with or submitted to residents. And residents rights may be curtailed. Further similarities with the Clover Development are potential site contamination and the combined Planning Scheme Amendment and Planning Permit and the application of an unconsulted DDO. As mentioned in our introduction, residents will have an opportunity to lodge submissions/objections to the developments when exhibition occurs (presumably with the next 4-6 months), however, GERA is highlighting these amendments now to ensure that local residents are aware of the significance of these proposals and have ample opportunity to prepare any individual or joint submissions/objections they may wish to make. GERA will supply what ever assistance it can to individuals or groups objecting to these proposals which will adversely affect residential amenity. Council is currently updating it’s website – at the time of making this posting the links provided to Council website worked. However, as Council continues to update it’s website the links may not function in future. GERA will try to keep the links functional. The Minister for Planning must firstly authorise preparation of the amendment before exhibition can occur. Following this, notice (exhibition) of the amendment will commence, inviting public submissions/objections. If there are no submissions/objections Council can ‘adopt’ or ‘abandon’ the amendment and forward it to the Minister for certification or approval.  request the Minister to appoint an Independent Panel to hear the submissions. If a Panel is appointed, submissions/objections are heard and the panel reports its findings in the form of a recommendation to Council. Council then considers the panel report and makes its own decision. Council is not bound by the panel’s findings. If Council adopts the amendment, it is then referred to the Minister for Planning for approval or certification (and subsequent approval by Council upon receipt of certification from Department of Community Planning and Development). * Environmental Audit Overlay (EAO) – will be applied to industrial land subject to rezoning to a more sensitive use (eg. residential). This is standard (automatic). The EAO ensures the land is cleaned to the standards considered acceptable by the Environment Protection Agency). ** Special Building Overlay – this overlay identifies land in urban areas liable to inundation by overland flows from the urban drainage system. The overlay’s intention is to ensure that the development maintains the free passage and temporary storage of floodwaters, minimises flood damage, is compatible with the flood hazard and local drainage conditions and will not cause any significant rise in flood level or flow velocity. *** Design and Development Overlay – The purpose of the DDO is to identify areas which are affected by specific requirements relating to the design and built form of new developments. In the Glen Eira context, it may also protect the streetscape by prescribing consideration of front and/or side fencing. 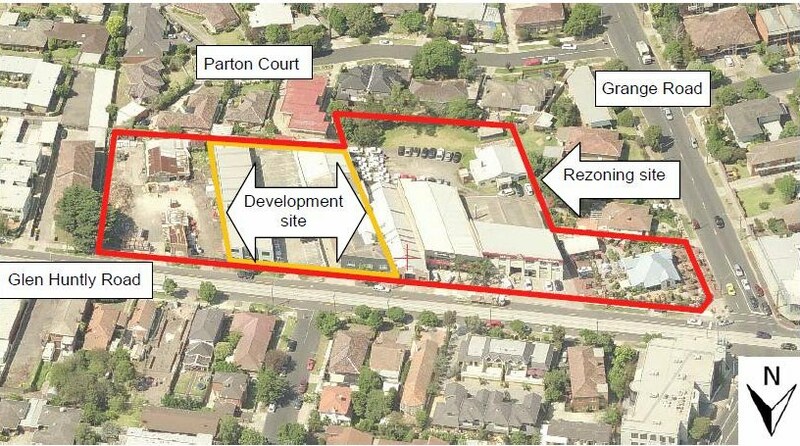 The below pdf file is a posting submitted to GERA by a resident who is concerned about the impending adverse traffic and parking impact the land locked Bentleigh East Clover Estate development (a 50 – 60 lot subdivision almost opposite the GESAC complex) will have on local residential streets. Although the planning approval process commenced in 2006 (with a combined Planning Scheme Amendment (C52) and planning permit application) the development has only recently commenced infrastructure (roads, power, water, sewerage, drainage etc.) work. The delay was primarily due to soil and water table contamination. As the Clover Estate residential development is situated on land that was previously an industrial site, an Environmental Audit Overlay (EAO)* was placed on the development in 2006. The EAO prohibited the “construction or carrying out of buildings and works” for the residential development until the Environmental Protection Authority issued of Certificate of Environmental Audit for the site. The Certificate was issued in March, 2011, and recently work on the site infrastructure (roads and utilities) commenced. via the application of a Design and Development Overlay restricted residents rights to object to the development. 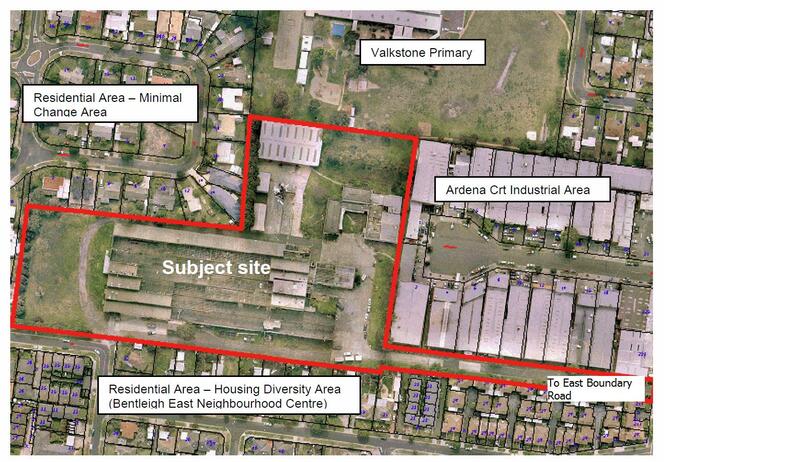 The site is located within the block bounded by McKinnon, Tucker, Centre and East Boundary Roads, Bentleigh East. The development is located in a minimal change area and abuts the housing diversity (i.e. high density) area known as the Bentleigh East Neighbourhood Centre. 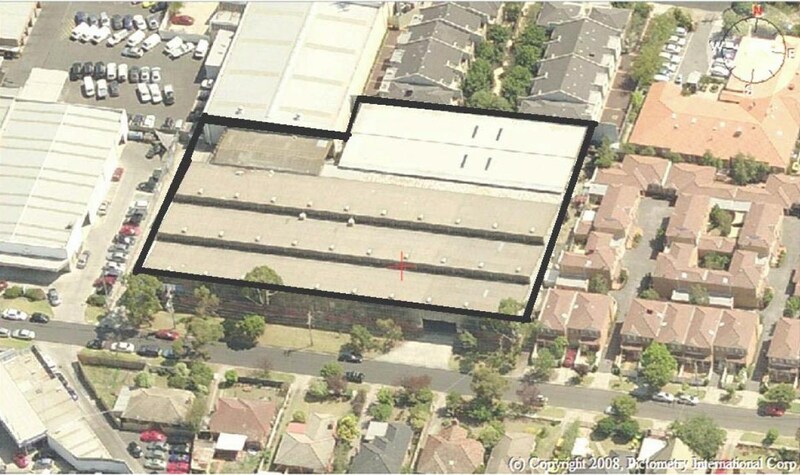 Currently, the address of the site is 219-221 East Boundary Road, East Bentleigh. Although the site had some frontage on Ellen Street, when operating as the Boral/Cyclone foundry and factory, access was from East Boundary Road only. In 2005 Harofam P/L (a development company) acquired the site and in 2006 submitted a combined planning permit and request for a Planning Scheme Amendment C52 to rezone the land (from industrial to residential) request to Council. Details of the proposed development were given as 50 housing blocks, 22 two-storey townhouses and 8 units, totalling 80 new residences. Access to the development would be via the existing the East Boundary Road access point and a new roadway connection at Ellen Street (effectively an extension of Malane Street). It was recognised that this new connection would alter the Ellen Street–Malane Street-Charles Street traffic patterns from being local access only to also becoming the through route to the development. It was also recognised that a traffic control device of some type (later determined to be a “Give Way” sign) would be required at the Ellen–Malane Streets intersection. Design Development Overlay (DDO) – to outline specific built form guidelines and if complied residences within the Clover Estate would not require an individual planning permit. Planning permits would only be required for dwellings not complying with the DDO. The DDO requirements were not discussed with residents prior to them being applied and, by applying the DDO, Council restricted residents’ ability to object on development design criteria. Vegetation Protection Overlay (VPO) – to establish tree protection zones for trees identified in an aboricultural report dated July, 2005. This overlay was later removed as the trees it sought to protect had also been removed. Residents strongly objected to proposal (173 objections) and over the period 2006-2007 the development was discussed at Council Meetings (22nd May, 2006, Council Minutes – section 8.3 and 25th September, 2006 Council Minutes – section 8.1) and an Independent Planning Panel Report – Amendment C52. During this period the planning permit application was separated from the planning scheme amendment. In December 2007, the developer submitted an amended planning application to Glen Eira Council. This amended planning application was for 50 housing blocks and 10 two-storey townhouses. Local residents lodged 126 objections to these revised plans. In February, 2008, Council approved the subdivision of the land (Council Meeting Minutes, 26 February, 2008) and the lots were sold off the plan at an auction in 2010 (Leader Article on sale of subdivided lots). Settlement on the sale of the lots was conditional on the completion of Clover’s infrastructure (roads, power, water and drainage). The delay in commencing the infrastructure works (due to soil and water table contamination) means this work is currently ongoing. The local residents/objectors have consistently raised traffic and parking congestion in surrounding streets and traffic management in the immediate area as being key issues. Although infrastructure work is ongoing (an estimated timeframe is not known) it is believed that dwelling construction is imminent. As a result Council, without consulting residents, is beginning to introduce restricted parking in Ellen, Charles and Malane Streets and installing a “Give Way” sign where the Clover Estate connects to Ellen Street (aka the Malane Street extension). These were the traffic treatments recommended in 2006/7. Since that time there have been substantial developments both in the streets named and the surrounding residential streets which have significantly added to the traffic volumes. Additionally the proposed Centre Road reduced speed limits and approved 5 storey multi unit developments in Centre Road will also adversely impact traffic volumes in the named streets. Residents have now added the issue of an unco-ordinated approach to traffic management and parking to their concerns.